Webisode 2: Egg Roll Recipe. I’m thankful to be able to share this second webisode with you. It was certainly a labor of love and we (my crew and I) are more than thrilled with the outcome. Enjoy yourself some egg rolls! A BIG BIG SPECIAL THANK YOU to my KICK A** CREW! I LOVE YOU GUYS! 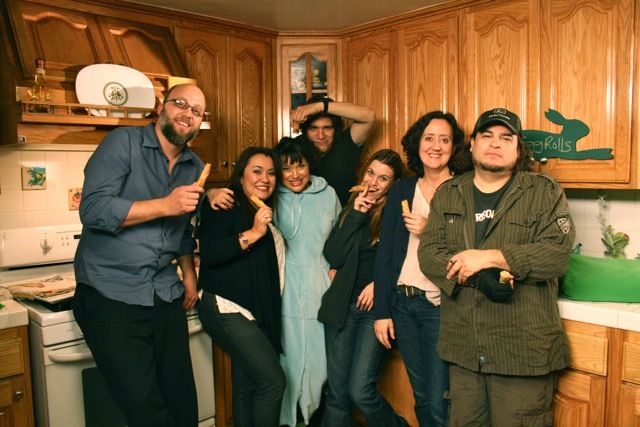 A photo of the crew and I after the webisode wrapped at 3:00 in the morning. From Left to right: Ford, Janine, Myself, Mando, Lacey, Kristen, and Tony. 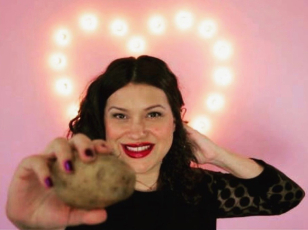 February is Potato Lover’s Month: Casuelitas Video Recipe! Your post made my day! “I want to be an eggroll”. Thanks for making cooking so much fun. Look forward to the next webisode. You all make a great team. Very cool nicole congrats i enjoyed it. You are freaking wearing a cape…. then an egg roll costume!!! I love, love, love, love it!! Congrats to you and your crew on such an awesome job! I wanted to act like James Brown with that cape. 🙂 hahhhahhaha! Hahahahaha you’re an egg roll! I freakin love your webisodes! I love it 🙂 So funny, even my 6 years old daughter was laughing, she told me ” Mom this girl is way to funny, and those egg rolls looks delicious”. Can’t way to see the next webisode. Thank your daughter for me and thank you too! Watch out Gicel…. you might be in the next one. Holy moly girl that is quite the fancy production. WOW! YUMMY looking video recipe — Super great job! You are too cute! Thank you! I’m a lucky girl to have a fantastic team behind me. That was AWESOME! You are TOO adorable! And of course now I want to make eggrolls. *drooling* That was an excellent video. Kudos to you & the crew! Nicole, I love this!! The costume, the recipe, the music, everything!!! I’ll have to make you a sleeping mask. I made my own. Holy crap! That was spectacular! You killed me with the egg roll song…hilarious! Loved this! Thanks, Nicole. I enjoyed the video, and now I´m craving egg rolls! Fabulous!!! I miss making vids!!! OH my I so want to do them again! They’re so much fun.. well, minus wrapping at 3 am!!! 🙁 I love it! You’re funny, girl! The dream was great. Are you kidding me?? this is freaking amazing! Girl…..I´m lucky to know you! I want more! Your video put a big smile on my face….you r crazy, girl! I mean that in the best of ways. Good job and luv you! Nicole!!!! You are too funny! Este video es muy chistoso!! La receta fabulosa!! I can’t wait for the next one!! Love this! Can’t wait to make egg rolls. Looking forward to MORE Presley’s Pantry webisodes!!!! OMG- Hilarious! But you know this means you have to come give me egg rolls right? I’m waiting! You’re on a roll! Eggcellent! Nicole, this is really great. I am so glad I came across this link to even check in on you. Great job. More egg rolls please! !